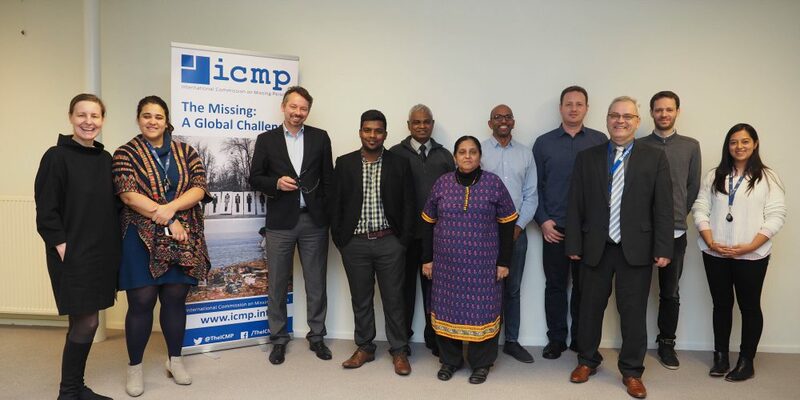 The Hague, 29 November 2018: Four of the seven members of Sri Lanka’s Office on Missing Persons (OMP) visited the headquarters of the International Commission on Missing Persons (ICMP) in The Hague this week to learn about ICMP’s programs on legislative and institutional development, civil society engagement, data processing, and DNA-led forensic techniques for human identification. Commissioners Nimalka Fernando, Mirak Raheem, Kanapathipillai Venthan, and S.K Liyanage were briefed by staff from ICMP’s Civil Society Initiatives, Science & Technology, Database Management & Coordination, and Policy & Cooperation programs. The delegation explained some of the challenges and strategic objectives of the OMP, which was established in February 2018, after President Maithripala Sirisena approved the appointment of the seven Commissioners of the OMP, a year and a half after the OMP was established by act of parliament. OMP Commissioners are appointed for three-year terms and the OMP is mandated to address all disappearances arising from political conflicts in Sri Lanka. The Office has significant investigative powers and the right to summon individuals and authorities, although it is not a judicial authority. It will have a staff of around 250 and 12 regional offices when it is fully operational. Initial objectives include collating and centralizing data, and informing families of the functions of the OMP and their rights. “States bear a responsibility for ensuring lasting peace, reconciliation and social cohesion – accounting for missing persons, and protecting persons against disappearance henceforth, is an integral element in securing this objective,” ICMP’s Director for Policy and Cooperation, Andreas Kleiser, said at the seminar. Sri Lanka has a legal framework to address the issue of missing persons, and the passage of a law on enforced disappearance in March this year will enhance this framework. However, national security legislation complicates transitional justice efforts, and there are legislative gaps and limitations in technical capacity especially in relation to locating and identifying the mortal remains of missing persons. Currently, there is no unified list of missing persons in Sri Lanka. Successive commissions have been appointed over several decades, compiling disparate records, some of which have not been made public. The OMP has begun creating a database of information based on missing persons reports and applications it received from the government. The total number of missing persons as a result of the conflicts in Sri Lanka remains unknown. It is estimated that over 70,000 mostly Tamil, Sinhalese, and Muslim civilians lost their lives during the conflicts in the North and East of the country. The island-wide figure is considerably higher considering that Sinhalese youth, students and others were killed during in the JVP insurgencies in the South and West and in the highlands, which are said to have claimed the lives of over 40,000 people. In addition, more than 38,000 people lost their lives to the South Asian tsunami in December 2004. Although not conflict related, the tsunami tragedy accounts for numerous mass graves, which will impinge on a future process of locating conflict-related missing persons. ICMP is a treaty-based intergovernmental organization with Headquarters in The Hague. Its mandate is to secure the cooperation of governments and others in locating missing persons from conflict, human rights abuses, disasters, organized crime, irregular migration and other causes and to assist them in doing so. It is the only international organization tasked exclusively to work on the issue of missing persons.